At my young age, i pray Buddhism becoz of my family's religion and fear. Later, i read, analyze, and believe in that was scientific. Later, i realised i became Atheist. But, my behavior is the same as you wrote, except church. I heard and read Buddhism book and quote, "Believe Nothing no matter where you read it or who had said it, unless it agrees with your own reason and your own common sense." I think you became Atheist - due to you believe in Science. Now, I proud to say, "I am a buddhist". p.s. I don't believe in Past and Future life. I don't believe in others .... because i have no experience in it. If there is a law that it don't believe in future life - u can't be Buddhist, so i will be Atheist. 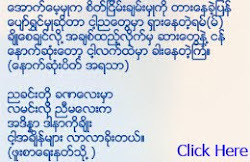 ေကာင္းကင္ကိုရဲ့ ကဗ်ာေတြကို ဖတ္ျပီးတုိင္း မ်ားေသာအားျဖင့္လုိက္မေဖာ္ေဆာင္နုိင္ရင္ေတာင္မွခံစားမ်ွေဝလက္ခံတယ္.. ဒါေပမယ့္ ဒီေဆာင္းပါးေလးကိုေတာ့.. *ဘယ္ဘုရားကုိမွလက္မခံဘူးလုိ႔ ဆိုလိုတယ္လုိ႔ထင္ရတယ္... အဲ့ဒီေတာ့ သင့္ကိုသင္ I am God လို႔ ဆုိလုိရာေရာက္တယ္... ဒီေတာ့ျဖင့္.. အဲဒီေဆာင္းပါးေလးရဲ့ဆိုလုိရင္းကို ေျပာင္းျပန္လွန္ေပးခ်င္ပါတယ္.... you are not God ေပါ့... ဒီလိုဆိုေတာ့... သင္သည္ "ဘုရားအားလုံးကုိ ယုံၾကည္လက္ခံသူပါ"
ဒီမယ္.. သူငယ္ခ်င္း.. တစ္ခုပဲေမးပါ့မယ္.. တကယ္ေလ့လာျပီးျပီလား..ေလ့လာေနျပီလား..တရားအရသာမသိသူအဖို႔ သူငယ္ခ်င္းလိုပဲ ျဖစ္ေနမွာပါ..
တရားအရသာကို နည္းနည္းေလးရိပ္္မိတဲ့သူေတာင္ အင္မတန္၀မ္းသာၾကတာဗ်႕.. ေနပူပူခရီးခဲၾကီးသြားေနတုန္းျဗဳန္းဆို အရိပ္ကေလးေအာက္ နားရလို႔ ပင္ပန္းမႈေလးနည္းနည္းေျပတာ သိတာနဲ႕ ဒီေနရာဟာ ဧကန္ ဆင္းရဲေပ်ာက္တဲ့ေနရာပဲလို႔ သိသလိုေပါ့.. ပင္လယ္ေရ ငန္ေၾကာင္းသိဖို႔အတြက္ ကုန္ေအာင္ေသာက္ၾကည့္စရာမလိုပါဘူး.. လွ်ာေလးနဲ႔တို႕ရင္သိပါတယ္.. အခုလည္းတရားအရသာသိဖို႔ အေျခခံေလာက္ေတာင္မရွိတာကို သိရေတာ့အံ့ၾသပါရဲ႕..